Today Satedans start fighting each other and then a Satedan starts fighting a console. Teyla and Ronon are walking off-world only to be ambushed by The Michelin Man himself, Tyre, and stunned. The rest of the team decide to go off-world to find a Satedan that Teyla’s run into before to help them find both Tyre and Ronon, with Woolsey’s permission of course though the Expedition leader brings up Teyla’s lack of decision to rejoin the team officially first. On an unknown planet Ronon wakes to find himself tied to a chair only accompanied by a rather shaky looking Tyre. It turns out Tyre’s low on his supply of Wraith Cocaine and is suffering major withdrawal effects. Though Ronon tries to break through to Tyre it turns out that his former comrade has called his old master who soon arrives and begins his attempts to break Ronon. FART’s venture off-world quickly turns up the Satedan they were looking for, Solen Sincha, who reveals that Tyre is no longer employed by the Wraith due to his failings and is now turned loose as an example of what happens to Wraith Worshippers who fail. Though Solen doesn’t have anything information to hand he does agree to inform the team of anything he does hear so that they can rescue Ronon and kill Tyre. When they return to the city soon after Teyla talks further with Woolsey regarding her lack of confirmation regarding her place on the team to find the by the books man surprisingly understanding of her situation. Eventually for the team on Atlantis their Satedan source comes through for them and informs them of where Tyre is keeping Ronon but only find the druggy on the floor of the building as the Wraith has taken Ronon back to his facility to continue his attempts to break him. Tyre is soon strapped to an isolation room table until he recovers from his withdrawal. While waiting Teyla, who’d missed the rescue mission, confronts Sheppard about him not bringing her but he counters that her lack of decision on staying with the team isn’t sustainable for either her or the team. Later that night Kanaan tells her he’ll respect any decision she makes regarding her future. On a desert planet Ronon finds himself strapped to a Wraith net where the Wraith continues to the attempts to break him and eventually succeeds getting him hooked on Wraith Cocaine. By this time Tyre has recovered from his addiction problems and helps lead FART and SART on an assault of the facility to rescue Ronon. When they find their former friend he’s a willing puppet of the Wraith and Tyre suddenly sells them out too, leaving them trapped in Wraith custody. Tyre convinces the Wraith leader to turn the teams into more worshippers and has Sheppard be the first to be converted. As the leader attempts to feed however Tyre cuts off the Wraith’s hand, it turning out that Tyre had armed Sheppard before the meeting and had planned to double-cross the Wraith, having freed the rest of FART earlier. As Tyre and Ronon fight Lorne and SART are freed by Teyla and Meredith before coming to the main chamber where they stun Ronon and rescue him. Tyre however, heavily wounded, stays behind and sacrifices himself to destroy the facility with C4. Back on the city the team are forced to watch the slow process of Ronon attempting to recover from his little Cocaine habit. Eventually the Cocaine breaks down and Ronon recovers, now having to mourn the loss of one of his few Satedan comrades left. Elsewhere Teyla finally makes her decision and reports it to Woolsey, who wears full suits in his off time, that she’s going to stay on the team. So here we are with the final real Ronon focused episode and it’s more a revisiting of the previous one from season four. Even so it still works out rather well mostly. 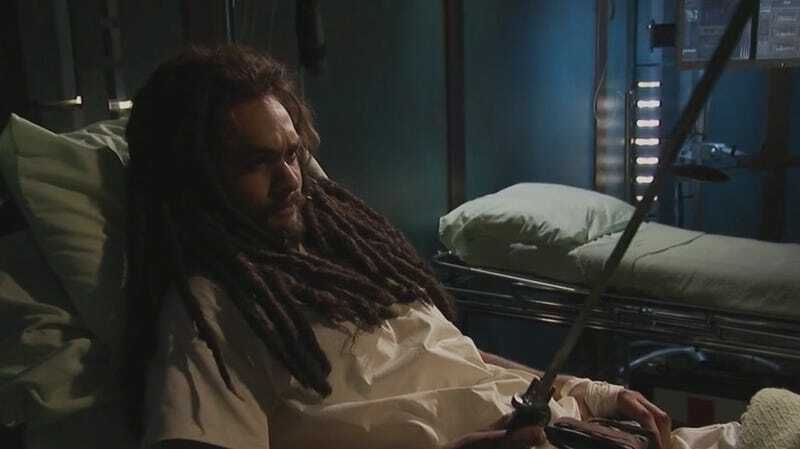 The main story of course is Ronon being captured by the Wraith and turned into a waster druggie for parts of the episode and this is played alongside the simultaneous recovery of Tyre and his attempts at redemption. The placing of Ronon as being able to be broken is an important one for the character who until now has always stood as an example of Satedan defiance in the face of the Wraith but now instead finds himself in the same situation who he condemned his friends for falling into. Not only does it make him more human but likewise enhances Tyre’s redemption arc because you can see just where he fell to in the process before finally taking back his destiny. If there was a small issue with Ronon’s arc it was that he sometimes felt more of a passenger when Tyre appeared but overall it’s still an effective way of presenting the character. Elsewhere you also had a side story involving Teyla’s internal conflict on whether to return to the team or not. Honestly I didn’t really care for this plotline as we already knew it’d be an obvious yes to returning to the team because of her bloody contract. If anything it ended up more of a character opener for Woolsey who awkwardly but believably tried to help her decide on how hard the decision should be for her, attempting to talk about a similar situation emotionally for him that he once had to go through. Woolsey really does start to steal the limelight on this show emotionally and I can’t help but feel that Teyla’s emotional and character arc started to seriously weaken after the baby plotline and pretty soon it dies completely as the show has no idea what to do with her. Talking of Woolsey not only does he start to steal the emotional depth of the heart but he also starts to really take over with the “straight man” comedy aspects of the show with his awkward placement in the rather bizarre world he now inhabits. Atlantis always suffered when it came to the comedy, with the only real sign of it usually being Meredith’s overreactions to events. Now however Woolsey fills a more traditional comedy role and it really shows quickly. Small scenes such as the doors not opening for him and his attempts to calm the baby before immediately panicking are memorable because of how distinct they are in the episode and in the season as a whole really quickly start to set it apart from the rather serious earlier seasons. In the end it’s a good final episode for Ronon’s specific storylines. It’s not the best one of the lot, weakened by questionable secondary storylines, but it still holds up with some nice deconstruction of known characters and the building up of others. · FART seem to be abducted a lot these days. · Even the city hates Woolsey. · Woolsey really isn’t good with kids. · I take it a cut season 6 storyline would’ve ben Meredith electrocuting himself in the bath. The episode begins with Sheppard and Meredith leaving a briefing discussing whether Teyla is hiding her baby from Meredith after he practically dropped him one time. They’re stopped however when the Daedalus mysteriously arrives in orbit with no lifesigns registering. FART take a Jumper up to the ship only to be told the Daedalus they know is in the Milky Way and in contact with the SGC. On arrival they find the ship has been attacked by something and there’s an energy buildup onboard. Venturing inside they find the place abandoned but find a log left by the ship’s commander that they abandoned it at some point for an Earth-like planet for unknown reasons. Soon however the energy spike picks up and the ship suddenly loses contact with Atlantis. Exploring the ship further they end up finding the cause of it, the ship contains a drive that jumps realities, given away when they find a dead FART from another reality. Meredith starts trying to find a way to stop the drive, finding that it just endlessly draws power and jumps uncontrollably, which forced the crew to eventually jump ship. Before long the drive jumps again only this time finding the city there non-responsive and an unknown alien vessel in orbit above. Soon the vessel begins firing on the city below so the team decide to intervene in fighting the alien vessel. The enemy ship soon launches a swarm of unknown fighters to attack the ship which the team fail to deal with. One of the fighters they do manage to hit kamikazes into the ship doing serious damage. Given the bad situation Meredith decides to improve the efficiency of the drive which will increase the rate at which it jumps but can’t be undone, meaning it’ll eventually jump every few seconds. The next reality is even worse however when they find themselves close to an alternate system where the sun went red giant much sooner and is now cooking the ship. With no hope without shields the team decide to head down to the engineering decks to push more power into them. On the way down to engineering Ronon begins to hear disturbances nearby and goes to check, only to find that the kamikaze alien didn’t die. The alien easily beats the crap out of Ronon but the Satedan manages to alert Sheppard to come and help. Together they kill the alien only to find the fighter had a crew of at least three, with two more now appearing. Inside engineering Teyla is unable to get the shields working enough forcing Meredith to turn off the shield and dump all energy into the drive which thankfully works, also giving a distraction for Sheppard and Ronon to kill the aliens. Unfortunately Meredith finds that the drive is close to burnout now meaning they only have a few jumps till it stops working altogether. In the new reality, a big asteroid field, Meredith reveals he’s put the drive in reverse so that they’ll pass backwards through the ones they’ve gone through and can jump off when they reach their one. Knowing they’ll pass back through the reality with the now hostile aliens Meredith attempts to get the sublight engines working again. Soon after jumping to the alien reality they’re attacked by another wave of fighters who soon catch up despite the attempts to flee via sublight. As the Daedalus looks done for a wave of F-302s led by an alternate Sheppard arrive to save them, revealing that this version of Atlantis is under Expedition control. After saving the ship the two Sheppard’s rub each others ego before the ship jumps again. Nearly home the team attempt to make it to the hanger bay and get on the Jumper only to find that another alien was still onboard who wounds Meredith and then detonates an explosive, preventing them from getting to the hanger. When they do arrive in the right reality the city detects them and sends up a Jumper with Lorne and Zelenka, only for the ship to jump again. While they first think they’ve lost the team they find that they bailed in spacesuits and are ready to be picked up. In the infirmary Meredith sets about recovering, believing he could build the drive perfectly this time only to be told not to by Sheppard, when Teyla comes in and presents Meredith with Torren to hold for a minute. Teyla comments that Meredith may make an excellent father, a comment that scares both Sheppard and Meredith. The Daedalus Variations is the last of the “team visit an alternate reality” started all the way back at the end of season one of SG-1 with There But for the Grace of God but this one is a remarkable change from the style we’ve always seen up to now. Instead of a long trip in one other world we now have an almost clip show style one where they visit a number of different alternate realities for brief periods, each with a threat of their own. As an action centric episode is works rather well in that new style as it keeps the threat from getting stale and keeps them moving. The weakness of this new style however is that it does create far more questions than it answers but that’s ok as it’s sometimes more interesting than a not great answer. The effort they clearly put into the episode is pleasantly surprising. In the past the “alternate” enemy was usually a parody of Star Trek in that they’d have terrible facial hair they didn’t have previously but here they created an entirely new alien race that we never see again, which included a whole slew of VFX shots that must’ve been expensive. They’re an enemy who in their short appearance are far more menacing than either the Goa’uld or Wraith ever appeared to be so again it’s a shame this is their one appearance but what an appearance it was. Not much else to say on the episode as it’s an episode where not that much really happens in terms of character or wider plot. Instead it’s a small little reality hopping adventure that’s incredibly well put together and succeeds at pulling you in. · I wonder if they had a chance of running into Ace Rimmer. · Meredith caused all the problems? Gee what a surprise. · Ronon really isn’t good with non-shooting activities.